NOTE: This replacement map was accurate as of the May 2013 Line 11 filing with NEB. Enbridge may have adjusted Line 10 replacement details since then. In summer 2014, Enbridge entered into a maintenance and upgrade agreement with United Refining Co. (URC). URC has agreed to fund certain integrity costs necessary to maintain the Line 10 pipeline and also pay for half of the cost of the replacement of 20 miles of the pipeline in Canada. URC will pay Enbridge $36 million for integrity costs for 2014. Enbridge plans to begin building the first segment of replacement pipeline in 2015. URC’s share of the replacement cost of this section of the pipeline will be about $28 million. The agreement also provides for the replacement and upgrade of additional portions of Line 10, subject to regulatory approvals, and provided that a “put and call” agreement concerning ownership of the pipeline is entered into by year end. Under such an agreement, URC and Enbridge would share the cost of replacing the majority of Line 10 in Canada and part of it in New York, each party investing about $135 million over the next 5-6 years for pipe replacement. 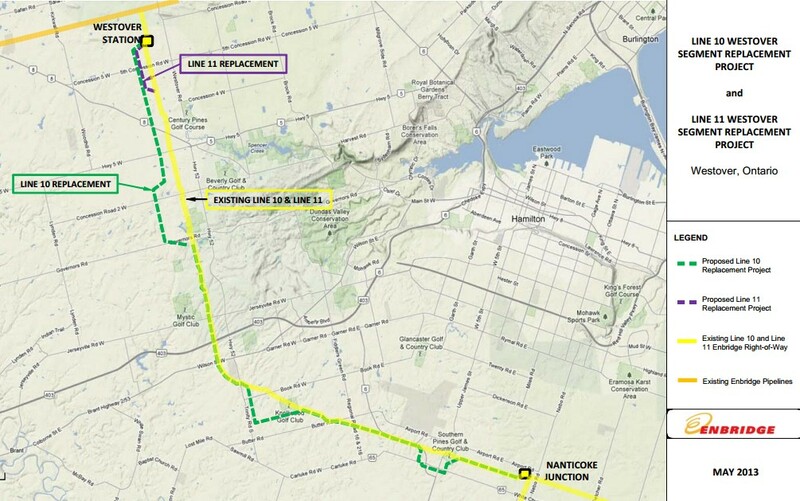 URC would repay Enbridge for its investment over a 10-year period for each section of Line 10 replaced. URC would have the right to purchase (“call”) the entire Line 10 from Enbridge at any time during the next 11 years and Enbridge would also have the right to require URC to purchase Line 10 (“put”) over a 2-year period starting at the later of 9 years or when all upgrades are completed.